Both Hubby and SIL backed up the recent advice of a reader to add an external hard drive to my constipated PC to better store my photos and music files, rather than trusting them to CDs. I’m grateful for good advice, so I’ve begun the tedious process of transferring the files one by one. But this time I’m taking the time to better organize them so I’ll have less problems losing things. I’ve been looking for a certain photographs for months now with absolutely no luck. So that explains how I found a peculiar folder hiding in some obscure file and I couldn’t explain in a month of Sundays how they found their way there at all. I had taken the time to title each one, however, and that in itself is a little out of the ordinary for me. Most of my pictures have titles like Image050 or Image050 (2) and the like. It’s understandable, therefore, that it takes a mite longer for me to sort and find the pictures I want to put into a post. Alas! It was not to be a mystery quickly solved, as my photo program didn’t seem to want to open any of those puzzling files. My eyes scrolled quickly to the last photo in the file and I read “dressed up ladies afterward,” making me all the more curious. I tried all the picture software on my PC; there are many. When my Image Express flat out refused to open it, I was beginning to wonder if my PC knew something I didn’t. Like maybe somebody had somehow managed to slip a file of, you know, sizzling pictures into my family oriented stuff. See? When you half have your mind in the gutter already, and you see a file like sewers, you might think toilets and latrines and the like. But in this case you’d be wrong. 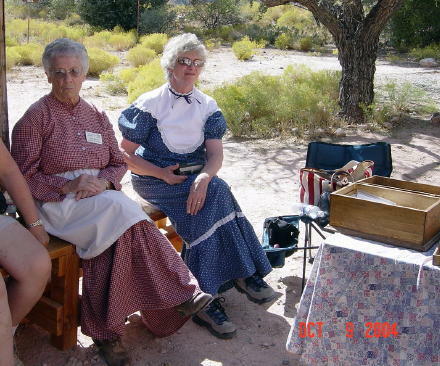 These are some of the ladies who were participating in a pioneer program at the Spring Mountain Ranch State Park just outside Las Vegas near Blue Diamond, Nevada that year–2004. I’ll bet you can hardly wait to see the naked ladies, now, huh? The pioneer program takes place once a year at the ranch, in the fall, and the docents there take the opportunity to do a little fund raising for a few extras for the cash-strapped state-run park. It’s a good place for the kiddies to learn what it was like living way out in the desert when the west was still being settled, maybe assist in washing a few clothes in a washtub or making lye soap, or talking to a slew of mountain men demonstrate black powder rifle shooing. The dolls are part of the fund raising. 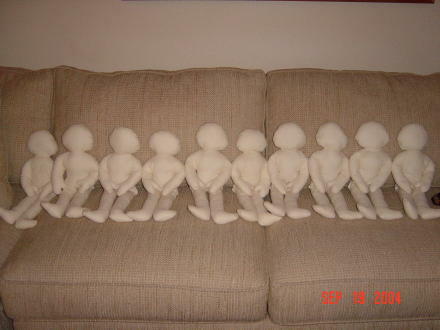 When I saw them lined up on a couch back at the ranch house while seamstresses worked furiously to make more clothes, I couldn’t resist taking a picture. Apparently it takes a little less time to sew the dolls than it does to make the clothes. You know how ladies are, wanting things to match and all. 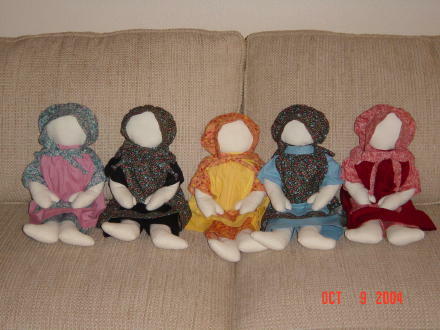 These five lucky ladies are already dressed up prim and proper and ready to go out to the cabin store. My title on the photograph naked ladies worked rather well in enticing me to open it so I could see what I had. Now I need to work on those photo files I’m transferring to the external HD and give them all equally intriguing titles, so I’ll be able to find exactly what I’m looking for in those 11,209,487 pictures waiting for my attention. Just one more note. We’re at day 28 of our month long daily posting adventure. Only two days to do. Maybe my last post for November will be about the number of cialis and viagra spammers were caught by wordpress’s anti-spam program. That might make an interesting post, huh? With any luck I’ll be finished in about 19 years. This entry was posted in musing, Musings, Photography, sunny side of life, Weird stuff by Alice. Bookmark the permalink. The dolls are so cute. Organizing the digital photos – the challenge of my life, sort of. I do have an external drive and anytime I delete the photos from the camera, I back up the photos from my computer before deleting the new photos. I also went ahead and paid for a photo storage site and copy photos there each month. This summer, my external drive died. It was probably a power blip that killed it and now the new drive is on the battery back up. But, I thought I’d lost my backup files (gasp). The company working on our new office computers was able to pull my files off of the dead drive and move them to a new external drive. We have power issues out here in the woods so, I have to be careful. My dad was the family photo person, and now I am. I’m not sure anyone will want my gajillion photos when I’m gone, but they’ll be there! The mere thought of organizing the photos I have on mine gives me the heebie-jeebies. I do like the idea of the external hard drive. I still haven’t got my laptop setup the way I want it because I need to get a network setup here. If I ever get things in order, it will be loverly! And yeah, I love those dolls! You will love the end result….and you will get there. It appears that often every time I moved into a new computer, I would drag and drop the photographs. Unsorted. Scans too. The mess was horrific. I now sort by year, and within the year by occasion such as Christmas 2009. Cars and trucks 2009. SD Bay 2009. If I play with an image in PS, I keep the origonal name such as OX12659 and just add to it with further defining data such as OX12659 Girl with hat 2 jpg. That tells me that the image has been photoshopped, it’s the second version of the image, and that it is a jpg. Jpg’s aren’t the best quality, but you have great versatility with them. When I fill up a folder and we have closed the year, I now move the old year over to my backup hard drive. Mage, I like your ideas and I believe they give me a way to go. I’d already started re-sorting by year, beginning with l968 and earlier, but hadn’t quite figured out how to organize within the year. I was thinking People, Animals, Places, Travel, and that sort. I think your idea is much better. I’m going for it. Thanks for the ideas. I have an uncountable amount of photos dating from 1800 to the present day covering 8 generations of family. I broke them down into my Father’s family, my Mother’s side and then a folder from the year of my parents wedding until we siblings married and began our own units they each have a folder now some with added grandchildren. Add the that friends, occasions, travel, blogging events and ideas for blog posts. Some days I wonder if there is any space on the hard drive.